Metrasens, makers of CellsensePLUS has partnered with the Indiana Department of Correction for interdiction of cell phones, weapons and contraband. 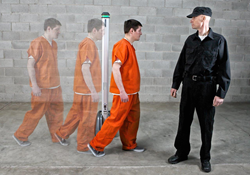 CellsensePLUS addresses offender use of cell phones to organize criminal activity from behind bars, including the intimidation of witnesses. “As in most facilities, contraband had been an issue in our facility and it poses a threat to inmates and staff alike” noted James Basinger, the Deputy Commissioner Operations for Indiana Department of Correction. “We’ve rolled out Cellsense to our state facilities to seek out dangerous items that offenders may have concealed on or in their bodies or hidden among their belongings,” he adds. “Over the last eighteen months, Indiana Department of Correction has focused on the prevention of illicit inmate contraband, and we routinely use CellsensePLUS as the primary tool in our arsenal to provide full-body searches of offenders and to screen mail, laundry, mattresses and inmate belongings,” he notes.